This chicken curry is from Western Mindanao (Curry Manok Iban Talum) region 9. It uses coconut milk with the curry powder and eggplant unlike the usual chicken curry we use to cook that uses milk and potatoes. 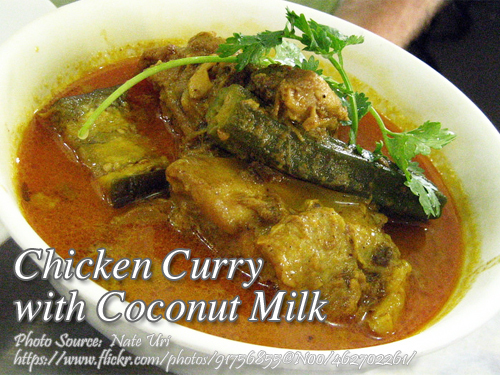 But many chicken curry dishes in the Luzon area were also using coconut milk but the usual vegetables are potatoes. Since this is a regional dish, it is recommended to use native chicken or commercially sold free range chicken to achieve the original taste of the dish. Free range chickens are bred and fed differently than the white broiler chicken. The feeds of free range chicken are all natural and indigenous to the place whereas the broilers are fed with commercial feeds. To cook this dish; Season chicken with salt, fry and set aside. Sauté onion, add chicken, thin coconut milk and curry powder. Cook for a few minutes. Add eggplant, cook until sauce thickens. When almost dry, add pure coconut milk. Season with salt and pepper. To see the complete recipe and list of ingredients in exact measurements, continue reading. Season chicken with salt, fry and set aside. Sauté onion, add chicken, thin coconut milk and curry powder. Cook for a few minutes. Add eggplant, cook until sauce thickens. When almost dry, add pure coconut milk. Season with salt and pepper. Serve hot. 6 servings.